Steam is one of the most popular gaming platforms in the world, giving you access to a wide variety of videos games and helping you connect with your friends. It also enables you to trade items, create new content for games in the Steam Workshop, manage wishlists, read the latest news and game offers, and so much more. Another great aspect of this gaming platform is the fact that it provides you with a simple solution for backing up and restoring your library. This feature proves to be of good use if you acquire a new PC and you're looking for a quick way to get your Steam library data from the old computer onto the recently bought machine. So, you will no longer need to spend countless hours to download large-sized games all over again. Instead, you will be able to create copies of your favorite Steam games and immediately restore them on a different PC. In a previous article, we showed you how to share your Steam games with your friends. 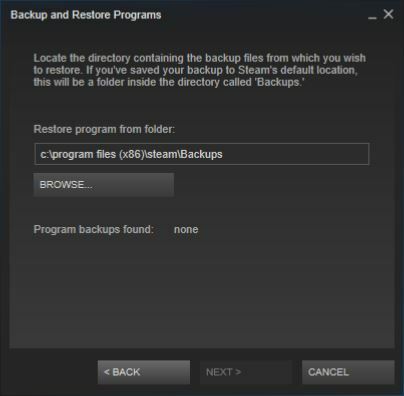 In this guide, I will teach you how to get access to your Steam games from a different computer by restoring a library backup. Download and install the latest Steam version on the new Windows PC. 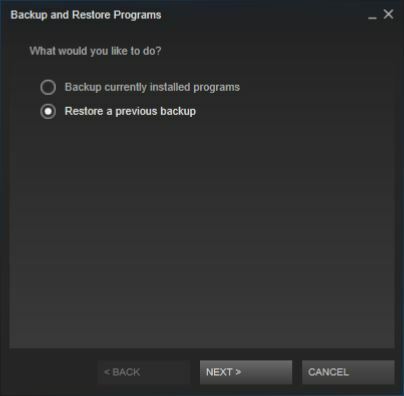 Go to Steam menu and select the "Backup and Restore Games..." option. Select the "Restore a previous backup" option and click the "Next" button. Select the library backup file you wish to restore and click the "Next" button. It might take a while for Steam to validate your backup data, but it's definitely worth the wait. Hence, it's very simple to restore a Steam library on a Windows PC. The question is: would you try the aforementioned method or download the games all over again when needed? Let us know in the comments section below.